6-month-old babies are active in many ways. They are learning to eat, talk, sit and move around. Many babies learn how to roll over if they haven’t earlier. And rolling over again and again, means that you get somewhere. At six months, even all our back sleepers tend to start being able to bring their chests all the way off the mat and support their weight on their hands, not forearms. The baby will start working towards toys out of reach. By now many babies can roll over both from the stomach to the back and the opposite way. Some can also sit up with just some support or even with no support. Other babies can’t sit on their own until they are eight or nine months old. A few 6-month-old babies start figuring out how to move around a bit by shuffling over the floor. Most don’t however. Some babies will start kicking hard while sitting in a baby bouncer, to make it move. Don’t leave the bouncer on a table! At around five or six months, babies can move objects between their hands. They also start looking for things that they drop. Many babies get their first tooth at around 6 months. If your baby drools more than usual or seems to have an itchy mouth, it may be a tooth on its way up.Just don’t believe the old saying that babies get a fever, diarrhea or cramps when a tooth is coming. All these symptoms indicate a sick baby and nothing else. 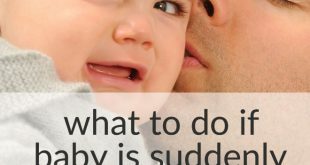 To learn about real baby teething symptoms, click here. 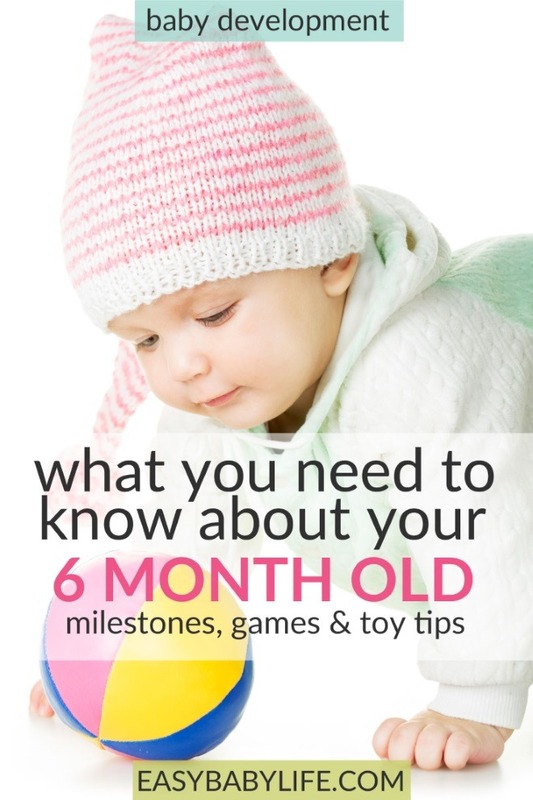 6-month-old babies babble a lot! They sometimes tend to get stuck in a certain sound, practicing it all day long. Then they suddenly switch to another. While stranger anxiety is slowly increasing, the 6-month-old baby is still mostly happy to meet other people. He or she might even be the one initiating a “conversation”. Your baby’s understanding of language is now well enough developed to start practicing baby sign language if you like. 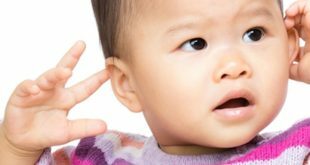 This is a fairly new thing for hearing babies. It has been shown, though, that babies that learn to sign, may actually talk earlier and will cry less as it is easier for them to make themselves understood. Imitating sounds is fun! Imitate your baby’s babbling. As their eye-hand coordination continues to develop, your baby might enjoy some practicing. If he/she has started eating solid food, try giving them small pieces of baby crackers or rice to pick up. Picking up toys from a bag can also be exciting and fun. Try putting toys made of different materials into the bag for some extra stimulation. Meeting other babies can be of great interest right now. Not that they will play together, but just seeing another one “like me” seems to be interesting. Once your baby has learned to sit without support a roly-poly toy is great fun. Toys that make sound when your shake them, turn them around or squeeze them, are good now when your baby can use both his hands. Does your baby like walking? My daughter decided that walking was all she wanted to do at six months. Not that she could. I had to choose between walking with her more or less every minute she was awake or listen to her angry screams. So tiresome! Then I bought a baby walker. What a relief! They will not help your baby learn how to walk faster. They can also be dangerous if your baby is left unattended in the walker. They can reach much higher and they can run into things. But as a toy near to someone who is watching over them – great for small impatient walking babies! Lots of baby walkers are poor quality. A good one, though quite expensive, is this one. In this video with 6-month-old babies, you can see that they are often much stronger and in better control of their limbs than just a month ago. Some sit really well without support now.